WASHINGTON/BOSTON (Reuters) - Wells Fargo & Co's (WFC.N) disclosure of how its chief executive's pay compares to the rest of its workforce has drawn criticism from some company employees ahead of the scandal-plagued bank's annual shareholder meeting. More than a dozen employees made posts criticizing pay details the bank released in March, according to comments on an internal communications website seen by Reuters. Separately, a worker advocacy group said it plans to raise pay issues on Tuesday at the shareholder meeting in Des Moines, Iowa. 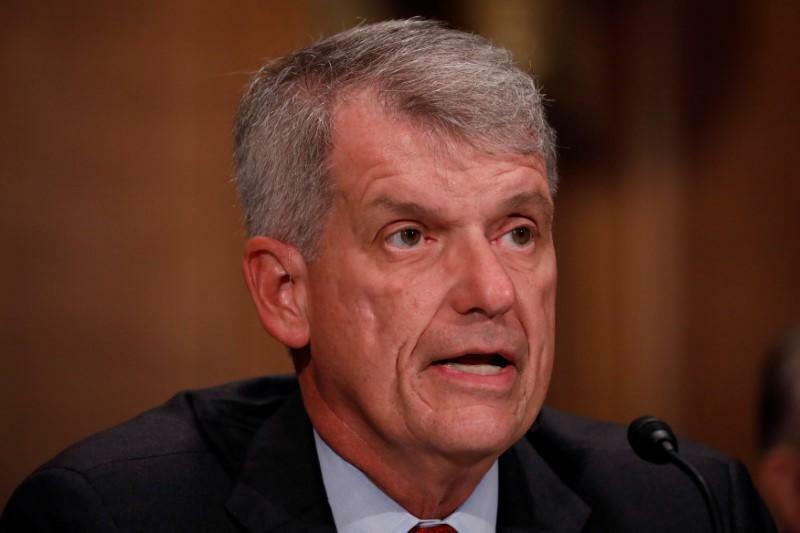 Wells Fargo CEO Tim Sloan earned $17.6 million for 2017, according to its proxy filing, an estimated 291 times the median of the annual total compensation of all the bank's workers. It is easy for Sloan to be optimistic about the future of the bank considering he is collecting a raise “on an already enormous salary,” wrote Vernes Rasidkadic, who left a job at Wells Fargo in Omaha, Nebraska, shortly after posting comments in mid-March. Rasidkadic told Reuters he stands by his posted comments. After several days, Wells Fargo closed the notice board to new posts, writing that some comments do not comply with company policies, according to the internal discussion. A company spokeswoman confirmed the discussion had been closed. When asked about the postings on Friday, a Wells Fargo official said the bank values constructive feedback. "We will continue to invite team member participation and encourage dialogue," said spokeswoman Diana Rodriguez. The bank in 2016 admitted employees had opened potentially millions of sham accounts for customers in order to hit sales targets, which led to the departure of its previous CEO. Sloan did not collect a cash bonus in 2016 and in 2017, although his total compensation for 2017 was 35 percent higher than for 2016. Wells Fargo's CEO pay ratio was higher than Bank of America Corp's (BAC.N) but lower than JPMorgan Chase & Co (JPM.N), according to data U.S. public companies must report starting this year. Those lenders have different business mixes and Wells Fargo skews more than some toward lower-paid retail workers. Wells Fargo raised its minimum hourly wage to $15 an hour in March, an 11-percent hike for about 36,000 workers, it announced in December on the heels of the U.S. tax code overhaul. The Committee for Better Banks, a group that includes labor unions and consumer and community advocacy groups, is calling for the bank to raise that wage again to $20. A representative for the group said Alex Ross, a Wells Fargo employee and activist with Better Banks, plans to comment on pay at the shareholder meeting and say that a raise would in turn help the bank's mission of rebuilding community trust following the scandal. On Friday, the bank said it agreed to pay U.S. regulators $1 billion to settle probes into customer abuses in auto lending and mortgages. A review of bank pay by executive compensation data firm Equilar shows Sloan earned roughly 20 percent less than Bank of America and Goldman Sachs Group (GS.N) paid their leaders for 2017. Among top Wells Fargo shareholders, representatives for Berkshire Hathaway Inc (BRKa.N) did not respond to questions on how it planned to vote its roughly 9-percent stake in the bank. A representative for the second-largest investor, Vanguard Group Inc, with a roughly 7-percent stake, declined to comment on its votes at the bank. Proxy advisers Institutional Shareholder Services and Glass Lewis recommend investors cast non-binding advisory votes in favor of the compensation of Sloan and other Wells Fargo executives.